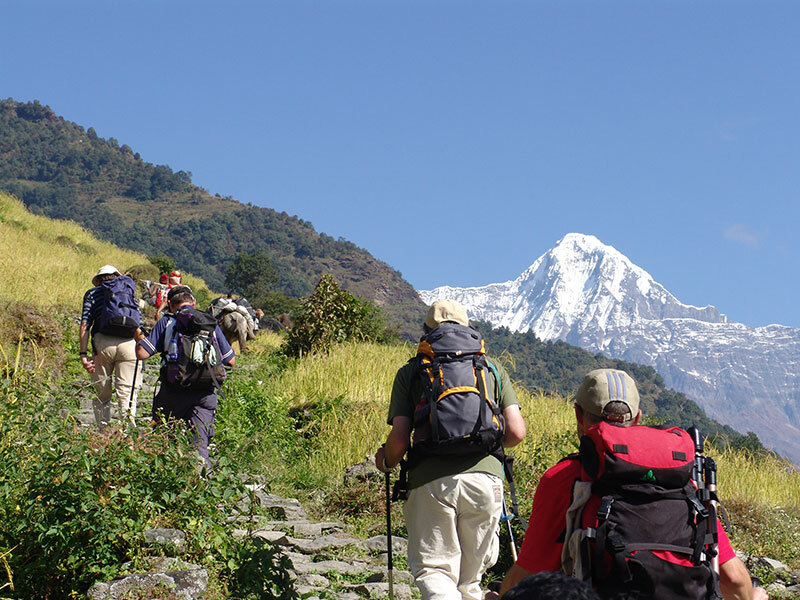 Mardi Himal Trek, in the Annapurna region is a short trek that takes you up to the Mardi Himal Base Camp. Considered more of a off the beaten tracks trek that was officially opened to tourist in 2012 the beautiful rhododendron forest and the rocky mountain terrain, this richly diverse trek is situated at the east of Annapurna Base Camp. With very few tourist visiting this area, Mardi Himal can be a considered a true “off the beaten tracks”. Travel through the rhododendron forests in this diverse genre. 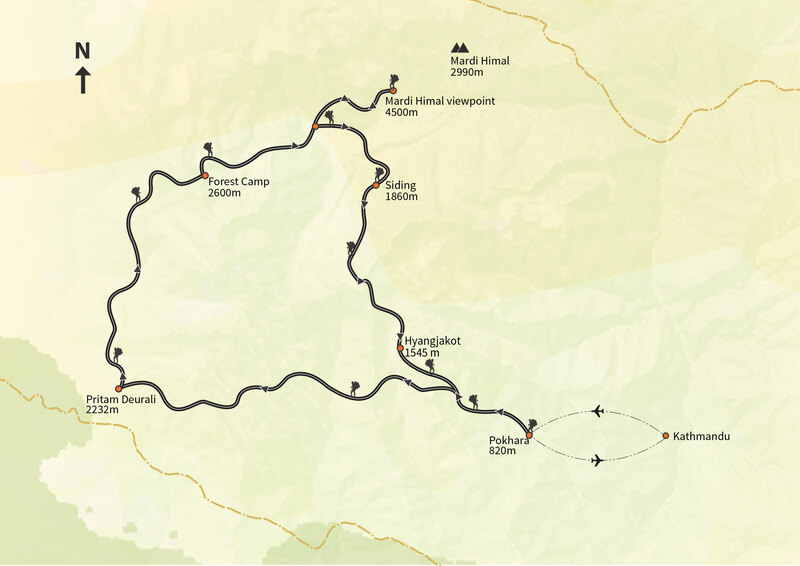 Visit Mardi Himal Base Camp in about 4 hours from the high camp. Enjoy the changing landscape in this amazing trek if you like less travelled area. After breakfast and depending on your booked flight timing, you will be transferred to the domestic terminal for the scenic flight to Pokhara. The flight takes about 20 minutes providing spectacular views of Langtang, Manasalu and Annapurna ranges. Once in Pokhara, you will be transferred to the hotel and your evening can be spent enjoying the boat ride in the Phewa Lake. After breakfast, our crew along with private vehicle will meet you at the hotel. From here you will drive to Phedi which is about 1-hour drive to start the trek from where you start your trek till Pritam Deurali through the rhododendron forest which overlooks the Modi Khola. Enjoying the view of the Annapurna South and Dhaulagiri at the height of 8,200 meters above sea level we start our walk after breakfast. Listening to the enchants of wild animals and birds, feeling the smell of national flower Rhododendron and other floras in the forest we trek back. An early start today as we begin our hike towards Mardi Himal (at an altitude of 4500m) Base Camp via Upper View Point (4200m). As the trip gets difficult through the steep climb and longer walk, the breath-taking scenes keep us occupied as we reach the Mardi Himal Base Camp in 2 hours with views of Mardi Himal, Machhapuchhre, Annapurna I, Gangapurna and Annapurna III. We return back to High Camp after enjoying the views. As we head back towards Pokhara through Siding, we pass through Ghalegaun which itself is another very less traveled region. 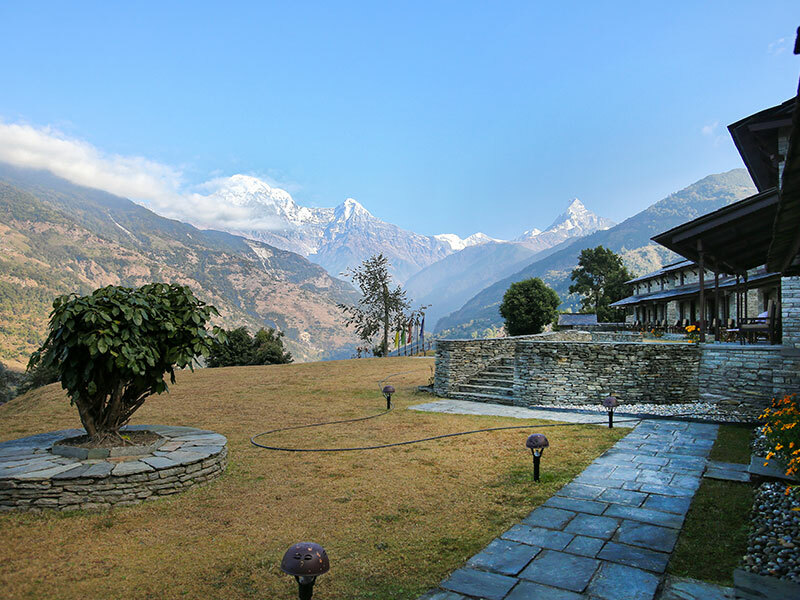 A Gurung village that is situated at the height of 2095m, it offers a firsthand experience of the Gurung people and their culture with an amazing view of Annapurna range, Ganesh Himal, Lamjung, and Manasalu. We continue our trek to Siding. Our last day today on the trek, we continue our trek through the forest. As we continue we will start seeing the houses, plow fields and motorways. After few hours, we reach to Hyangja (1070m) via Mardi bridge, a beautiful village full of seasonable fruits and vegetables. We continue and cross a suspension bridge and a little further our vehicle will be waiting for us that will take us to Pokhara. After breakfast, our guide will pick you up for a full day's excursion. During the trip, you will visit three sites listed as UNESCO world heritage sites. Pashupatinath: one of the most sacred temples of South Asia dedicated to Lord Shiva. Boudhanath Stupa: one of the principal Buddhism sanctuaries surrounded by numerous monasteries and Tibetan boutiques. Finally, Bhaktapur: this city is known for its sophisticated art, craft, colorful festivals and its unique culture. Later in the evening, you will be transferred to Le Sherpa Restaurant for a dinner. This tour spends three nights in a hotel in Kathmandu, two nights in Hotel in Pokhara and five nights on the trek in lodges (tea houses). In Kathmandu and Pokhara, we normally use a 3-star hotel, located within walking distance of the Thamel. Day 8 : Fly back to Kathmandu. Transfer to hotel.